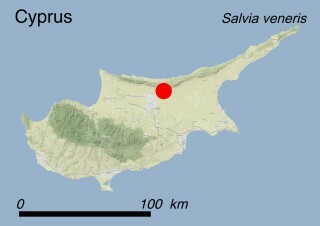 Endemic to Cyprus, Salvia veneris is localized in the northern and western surroundings of the village of Kythrea. It is restricted in an area of less than 20 km2, in five locations characterized by sparse woody vegetation (habitats 3.8.1: Maquis, arborescent matorral and thermo-Mediterranean brushes and 3.8.2: Garrigue), mostly on a particular substrate called ‘Kythrea Flysch’ including beds of greywacke, marl, sandstone and conglomerate. A small part of the population also grows on outcropping lava intrusions. It is estimated that there are approximately 4000 individuals. This perennial plant, 20-40 cm high, has a strong woody taproot and felty leaves arranged in a basal rosette. The short flower-bearing stems are produced in late March or April. The flowers are bicoloured, the upper lip pale blue, the lower white with pale yellow markings. Fruiting season is between April and May. The stems produce a faint, pleasant scent when crushed. The arrangement of leaves in a basal rosette is thought to be an adaptation to the strong grazing pressure by goats. This is a common trait of many sages of the Mediterranean mountains, yet unusual for plants belonging to the mint family, which normally have paired and opposite leaves. As the result of more accurate field surveys, this species is no longer listed as CR (Critically Endangered). 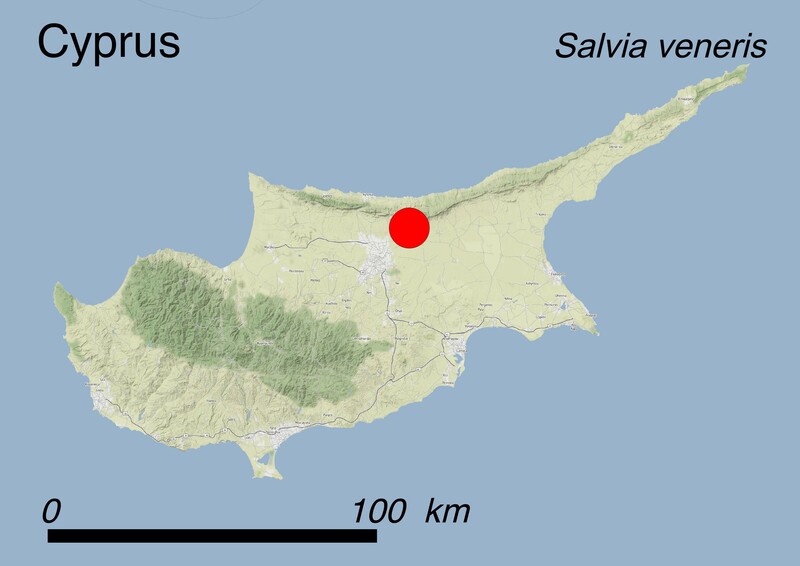 Salvia veneris is now considered and has been included in the Red Data Book of the Flora of Cyprus as VU (Vulnerable) according to IUCN Red List Criterion D2 which indicates that the area in which the species is found is very small with an Area of Occupancy <20 Km2. Moreover, it is found in only five locations and there is a high likelihood of decline in the area, extent and quality of habitat. This species is potentially threatened with any future expansion of the nearby village of Kythrea (threat code: 1.1 Housing & urban areas), which could wipe out a large part of the population. It is also potentially threatened with reforestation activities carried out mainly with Acacia saligna (threat 8.1.2: Invasive non-native/alien species - Named species) and with Pinus brutia (threat 8.2.2: Problematic native species/diseases - Named species), road construction (threat 4.1: Roads and railroads), military installations and exercises (threat 6.2: War, civil unrest & military exercises), grazing mostly by goats (threat 2.3.2: Small-holder grazing, ranching or farming) and dust from nearby limestone quarries (threat 9.5: Air-borne pollutants). Legally: The species is protected by the Habitats Directive where it is included in Annexes II and IV, and by the Bern Convention, where it is listed in Appendix I (under the synonym Salvia crassifolia Sibth. & Sm.). Moreover, the species is included in the Red Data Book of the Flora of Cyprus as a Vulnerable species. None of the locations falls within a Natura 2000 site. In situ: No protection measures have been taken so far. Ex situ: A small number of seeds of S. veneris are stored in the seedbanks of two public institutions of Nicosia: the Nature Conservation Unit of the Frederick University and the National Seed Bank of the Agricultural Research Institute. In situ: The distribution area of the species should be included in a protected area such as a Natura 2000 site as it is an Annex II species of the Habitats Directive. However, the site falls within the Turkish occupied area where the Community acquis is currently suspended. Ex situ: Cultivation in botanical gardens is recommended. Dr Marios Andreou, Nature Conservation Unit - Frederick University, Nicosia, Cyprus. Dr Charalambos S. Christodoulou, Department of Forests, Ministry of Agriculture, Rural Development and Environment, Nicosia, Cyprus.